Organizational health matters more than we might expect. Top management teams that are serious about developing vibrant businesses must look inward and assess the organization’s health objectively. The most effective leadership behavior reflects the state of the company’s organizational health. Is our leadership behavior strong enough in ways that matters most in keeping our organization healthy? Organizational health should come first when determining which kind of behavior will be most effective for companies. Companies should spotlight different sets of actions in different situations. Leaders often overestimate the health of their organizations and the effectiveness of their leadership. Too many executives default to describing their companies as good and striving to be great. This cannot be true. Companies cannot be above the median line of organizational health than below it. A robust assessment is necessary to have a more informed sense of what it feels like to be in one type of company or another. 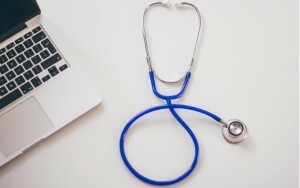 But since a rigorous self-diagnosis is not always possible, some rules of thumb have been developed to help assess the health of organizations. The use of the rules of thumb in assessing the health of our organization gives executives a more informed sense of what state our organization is in. The leadership style of a Healthier Organization shows greater support for colleagues and subordinates. Leaders are more sensitive to the needs of their employees. State of Health: Elite Organization. The leadership style of an Elite Organization challenges employees to aspire higher still by setting stretch goals that inspire them to reach their full potential. A survey was conducted to explore the effectiveness of different kinds of leadership behavior at companies in different states of organizational health. Purpose of the survey was to identify behaviors that matches organizational health with perceived effectiveness and to isolate those behaviors that were most effective in different situations. Based on a sample size of 375,000 people from 165 organizations across multiple industries and geographies, two core elements were analyzed. First quartile: Organizational Health – Leadership behaviors that are always present and those that are more or less prevalent in each quartile were identified. Second quartile: Leadership Effectiveness – Behaviors that are perceived to be most effective were identified. Analysis of the survey results showed the development of a Leadership Staircase, a pyramid of behavior analogous to Maslow’s hierarchy of needs. 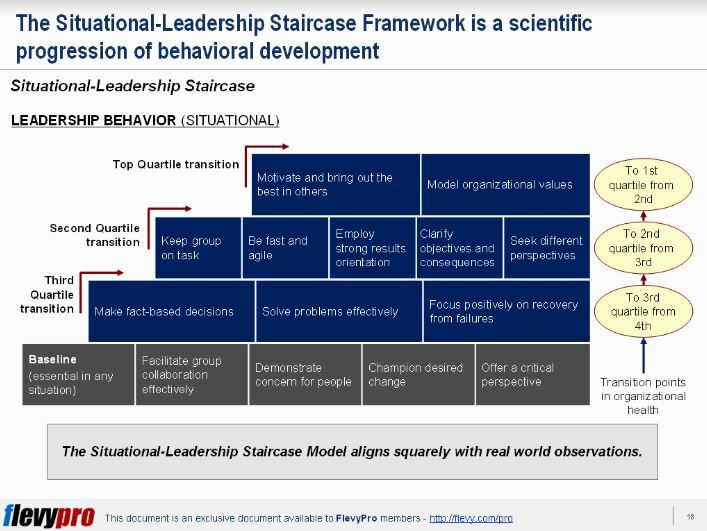 The Situational-Leadership Staircase Framework is a scientific progression of behavioral development . It is a pyramid of behavior analogous to Maslow’s hierarchy of needs. Some behaviors are always essential. Additional behavior become apparent as organizational health improves. Some behaviors are differentiators that can lift the organizational health of a company. The importance of employing different kinds of leadership behavior to improve organizational health will vary according to a company’s starting point. The Baseline Behavior is a set of behaviors that are essential for companies at every level. No matter what the company’s health may be, the following practices are essential. The absence of such fundamentals of healthy interpersonal interaction invites disorder. Shoring up these behaviors can serve to keep organizations from sliding backward into organizational trouble. The Third Quartile Transition lacks some or even all of the baseline forms of behavior. Companies in this level have low levels of innovation, declining customer loyalty, wilting employee morale, loss of major talent, and have critical cash constraints. Leaders of companies in Third Quartile Transition must be able to make fact-based decisions, solve problems effectively, and focus positively on recovery. Companies in the Second Quartile Transition have the ability to take practices that are already used at some levels of the organization. As such, companies need to keep groups focused towards well-defined results and have the agile behaviors that look at better ways of doing things. However, starting at the top can be a tragic move. A 3rd quartile company cannot apply the identifiable forms of leadership behavior of a top quartile company to immediately reach the top. Doing this can have irreversible effect. Reaching the Top Quartile requires a steady climb of preparation and growth. Interested in gaining more understanding on Situational-Leadership Staircase? You can learn more and download an editable PowerPoint about Organizational Health: Situational-Leadership Staircase here on the Flevy documents marketplace.